Four members of Slovenian Aikikai participated in a seminar by Christian Tissier Shihan in Amsterdam, organized by the Dutch Aikikai Foundation. They also practiced for two days in Vriesman Dojo. Jasmin Biščevič has successfully passed his shodan exam, becoming the Slovenian Aikikai Federation's third and youngest black belt. 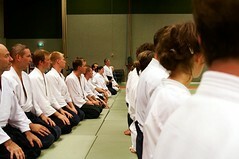 This is another step towards recognition of the Federation by Hombu Dojo (Aikido World Headquarters). On the weekend before May Day we were honored by Wilko Vriesman's third visit to Ljubljana, where he gave a seminar organized by the Slovenian Aikikai Federation. 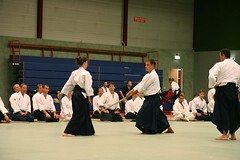 Around 40 participants from Slovenia attended, along with one guest from the Netherlands, representing Dutch Aikikai. Wilko Vriesman said he enjoyed the seminar and was happy to observe the group's progress, adding that he will continue to guide and stimulate Slovenian Aikikai.